In reality, it’s not the group that has to influence you, but you have to tune into the group yourself. When we say that the group has to influence a person, we want to inspire each person to bestow to the group. The group’s response may be powerful or weak, but that will not affect a person. That’s because our connection and interaction is with the inner group, not the external one. The external behavior of the friends does not play such a substantial role. Here everything depends on how strongly I tune into them, how much I try to feel their inner aspiration, which does not depend on me or on them. This is a spiritual reality, the unity between us on the level of Infinity. Therefore, the group influences you to the degree you tune into it and desire to receive its influence, its bestowal. Question: Is there a phase in spiritual work when a person can tell exactly whether or not he is similar to the Light through his qualities? Answer: On various phases we feel closer or farther, but the most correct example is a person’s attitude to the group: How much does he feel that the group’s inner essence is the place where he wants to tune in, where he wants to “dissolve” like an embryo in a mother’s womb, like a child in his mother’s hands, to disappear and lose himself? If a person still has something that hasn’t disappeared, that he hasn’t lost, it means his egoism is still alive. But as soon as a person dissolves in the group, from that moment on he begins to grow spiritually. Inside his sensation, desire, intentions, and effort a person can measure where he is: in which Reshimot, in which Sefirot, in what state, and how many Lights enter his Kelim. You Chose The Land Where You Will Grow Up! Question: What do we need in order to explain to the world the cogwheel principle? Answer: We all depend on each other one hundred percent. In different areas, it manifests in various degrees; however, any percentage except one hundred is a lie. Even if only one percent is visible, it means that the rest of the 99% are hidden inside. One way or the other, our interdependence is absolute, even if it appears to the contrary. Wherever you look, we are linked with iron chains of mutual connection, and there is nowhere to run from it. The more clearly it manifests, the louder humanity will cry. In truth, it means that you depend on your foes and rivals, on each and on all, and you don’t know what to do with it. As in a family, a husband and wife discover hate between them and total dependence on each other. We are all inseparable; there is no place to go. Here is our small apartment, our children, our refrigerator, our assets. And on top of all this, we hate each other to death, and we even can’t die. Such an unbearable predicament must be somehow softened, soothed. After all, this is what we call the birth of a new world, contractions before Messiah’s arrival. We shouldn’t hope that, having realized what is happening, the world will know how to act. In the Writings of the Last Generation, Baal HaSulam writes that people will never understand it, and never will a foe agree with a foe. Hence, we see the importance of the circulation of Kabbalah and our unification as a model for all humanity. Question: Correction occurs within us, and the message expands from us. Today is the Unity Day, and on January 28, 2011 there will be conventions in Berlin and San Francisco. In the light of all this, what is our duty? Answer: We have to discover that we are the cogwheels connected into a single mechanism called the “Worldwide Bnei Baruch Movement,” and that we are about to link with the whole world. Imagine how powerful our engine must be in order to “spin” everybody in one direction, with one intention, one pulling force, and in order for us to be able to connect the whole world to this “spinning momentum,” the movement toward oneness. The force must be such that additional load wouldn’t stop us, but rather would add more power to it. And this is what we are aiming to achieve. The Whole World? What A Trifle! Question: What is my responsibility for the world? If during the day I haven’t succeeded in something, does it reflect on the world? Answer: It certainly does. After all, you are a “cogwheel” in the common mechanism of creation. The Creator created the system where everyone is an egoist. This system is divided for you into 125 degrees or spiritual states: from complete separation from the others to an increasingly closer and tighter link of your cogwheel with the others, until all of you become one whole. Besides, this is how it looks only to you; in reality, there aren’t multiple people but only Adam HaRishon. You are affected by the same laws that work on everybody else. Your will to receive (desire) is simply greater than that of the others. They are satisfied with “trifles,” while you wish to “consume” the spiritual world as well. The point in the heart is not bestowal yet. On the contrary, the most “restless” desire of pleasures unfolds namely in spirituality. And only then, when this abyss opens up, a person is prepared for transformation. Question: It is written: “Do not trust yourself until the day you die.” Then what does Arvut (mutual guarantee) mean if I can’t trust myself or the friends? Answer: Obviously, I cannot trust myself. But this doesn’t refer to the friends. The group is not an assembly of people that just came to the lesson. The group is their inner unity between the souls. The Creator created desire (the will to receive pleasure, Kli) regarded as “the world of Infinity,” where the souls reside. 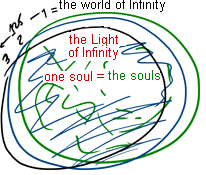 These souls are mutually connected into one collective system, one soul, filled with the Light of Infinity. But this system is blocked from you by the concealing screen, a filter, through which you see it somewhat corrupted or broken. Within, it is perfect and filled with the Light of Infinity, but presently you see it as distorted. Further on, behind the next filter, it seems even more corrupted to you. But this is incorrect. Everything is determined by your attitude to the friends. If a person “penetrates” through them, wishing to connect, not with what these corporeal bodies, which are in concealment, represent and understand, but rather treats them as the group that resides in Infinity in complete union, then the job is done: He adheres to this perfect state. So could Rabbi Yossi Ben Kisma not be without his beginner disciples. Do they desire spirituality in any small degree? That is enough for him to enter the spiritual state through them, where they are all one, as one man with one heart, although they themselves are not aware of it yet. This is called the environment, the group. However, I myself reside in the place where I can imagine myself. Then, I visualize myself against the ideal, perfect environment from which I can receive anything. And only through it do I gain the strength. Therefore, the group is not a physical assembly of men, but rather my inner spiritual property. Baal HaSulam, “Peace in the World“: And each and every individual in society is like a wheel that is linked to several other wheels, placed in a machine. And this single wheel has no freedom of movement in and of itself, but continues with the motion of the rest of the wheels in a certain direction, to qualify the machine to perform its general role. The first step on the path to success is to attain a sensation that we are all connected like cogwheels, having no freedom of motion in relation to each other. I cannot spin unless I make this movement together with everyone else. And if others spin, then I have no possibility of not spinning together with them. Therefore, only by reaching a mutual agreement can we attain movement that will be desirable to all. If the world reveals this law, it will be nothing short of salvation. And if we reveal this in our group, then we will be able to pass that vision on to the world. This must be the main topic of our dissemination; we have to explain the situation. However, the most effective form of dissemination is if we reveal this absolute, necessary, and mutual connection between all of us. This must be the main thought for us during events such as Unity Day, which is held by our Kabbalistic groups all over the world. We are returning to the same picture of interconnected cogwheels where none of them has its own freedom of action. No matter what illusions each one may have about it or how mistaken they can be in their blindness, it is still so. Therefore, I have to tune into the group in order to understand and feel how dependent and connected I am with others – not having even one free movement – not in my heart nor mind, and not in any of my desires, qualities, thoughts, and plans. Everything that I desire, dream of doing, or do in the end depends on others and I won’t be able to do anything unless I reach a mutual agreement and peace with them. The realization of the mutual dependence in the group, in society, or in all of humanity is the key to correcting the world and correcting man. However, if I am uncorrected, then on one hand this depends on society because it is the society that has corrupted me. After all, a person is a product of social influence. However, didn’t I choose that society and it is not in my power to influence it? A person cannot tune out from his society in both the good sense and the bad. Therefore, there is no assessment of a separate person, but only of his free choice, meaning what society he has chosen for his growth. Question: If the souls manage to unite, the Creator is revealed in their mutual connection. Who creates this connection, we or the Light? Answer: We never do anything. Everything is done solely by the Light. It broke desires (Kelim) and it reforms them. We must only express our willingness to raise MAN (Mayin Nukvin, female waters) and ask the Light to correct our connection and get revealed between us, fulfill us. It will do all that is needed. We don’t need anything but the plea, like a baby who is constantly crying and demanding. This is our entire work. There is nothing easier: demand, beg, cry! Oblige Him! This is what is called “my sons defeated Me.” We pressure Him, demand from Him, and that’s all He expects from us. This is how the entire upper system works: It expects only a plea from below since all that Bina (the Upper Mother) yearns is to “feed” the souls, fill them with the Light.